Always measure with a metal rule – cloth or plastic tapes can stretch. As a guide, tracks should be fixed at 4” (10cm) above the lintel, and poles at 6” (15cm). Width: Measure the track or pole (A) not the window. The track or pole should usually extend beyond each side of your window to enable the curtains to be pulled well back during the day. 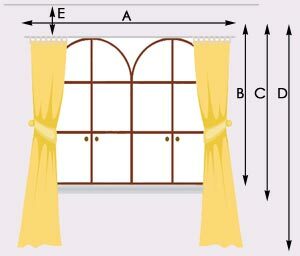 Length: Measure the point from where you wish the top of the curtain to be. IMPORTANT: Please allow at least +6 inches from the top of the window recess as a minimum. If a pole is already in place, measure from the bottom of the ring to the required finished length. Measure the point from where the top of the window recess meets the coving or ceiling (E). Please indicate if there is no deadlight. Width: Measure the track width not the window width (A). IMPORTANT: The track should extend +6" either side of the window side recess as a minimum (+12" in total). Inside fixings If the blind is to fit inside a window recess, please provide the exact width (G) and drop (H) measurements. 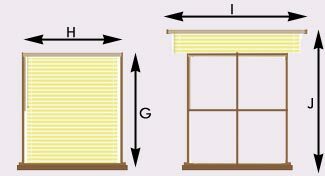 (Blinds are made 0.5” (1.3cm) smaller to accommodate movement during operation). Outside fixings Please provide track width (I) and not the window width. The track should extend 4” (10cm) each side of the window and be fixed 4” (10cm) above. The drop length (J) should be from the top of the track to the bottom of the blind when lowered. All measurements for bedspreads should be made with the bedding on. Width (P) and length (Q) and height (R) are required. The pillow gusset length will be 19” (48cm) and the gusset height 5” (13cm) – sufficient for one pillow – unless otherwise stated. The track length (K) measurement is required, plus any returns (L). Particular accuracy is required for hand pleated styles, which are tailored to fit. A floor to floor width (S) and length to floor (T) measurement (including pillow) are required. We will add 12” (30cm) as a pillow tuck.